Maida is a specific type of wheat flour from India. It closely resembles finely ground cake flour, so if you cannot find Maida you may try to substitute cake flour. This recipe has been previously published on Rachna’s blog and was republished with her permission. 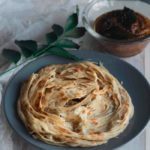 Enjoy this soft, crispy and multi-layered parotta with delicious curry. In a large mixing bowl, add all purpose flour, semolina, sugar & salt. Whisk it once. Add water in the flour mixture. Start kneading the dough. Dough consistency should be Roti/Chapati dough. Let the dough rest for 15 to 20 minutes. Knead the dough again, divide the dough into 4 equal size portion . Take one portion of dough, knead for a minute then roll in your palm to make a round ball shape. Flatten it with your palm & start rolling with a rolling pin. Roll the dough into a very thin sheet. Don't worry if it tears in between while rolling. Roll it as thin as possible. Melt butter to luke warm in a small bowl & mix with all purpose flour. Apply this mixture on rolled thin sheet. Once the mixture is applied all over, slice thinly all the surface of paratha. Then start scraping the dough from one side until it finishes resulting in long cylindrical stretched dough. Press the rolled dough with the heels of your palm to give it a round flat shape. Place a tawa (skillet) on medium heat. Place paratha on hot tawa. Cook it on both sides & smear ghee on both sides while cooking. Cook till brown spots appear on both sides. Once the paratha is cooked, smash it using your hands to separate the layers.